GLOGIRLY: AmazeCats Next Top Cat ??? We 'd never heard about the AmazeCats until a few months ago when Cat Chat was having an AmazeCats Famous Cats of the Internet Playing Cards giveaway. Truth be told, I was a little miffed to learn that I wasn't featured on any of the playing cards. Sure, there were the usual suspects like Maru, Lil Bub, Oskar the Blind Cat...even some Waffles impostor. But there was a certain tuxie beauty obviously missing. 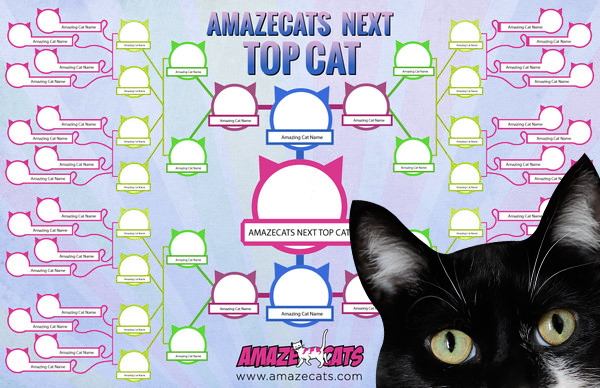 Recently AmazeCats put out a nominations call for the AmazeCats Next Top Cat. 32 cats of the internet will be named finalists...and I'm one of them! I have no idea who nominated me, but the AmazeCats people contacted Glogirly to share the big news, get my photo and bio...they even wanted one of my videos! 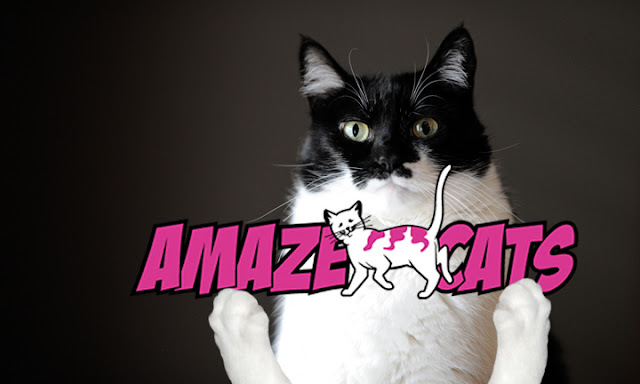 You can watch the AmazeCats promo video below to get a flavor of what it's all about. They've got a cool website and a Facebook Page too. Voting is going to start sometime this week. ...oh, stop your groaning already. We'll try not to beg like dogs. I would LOVE to be pictured on the next deck of AmazeCats playing cards!!! I'm certain EVERYONE would want to be dealt a Katie card. If I was the kitty-queen of hearts, I'd bring new meaning to the phrase *lady luck. * We'll keep you posted! We are terribly sad to learn of our dear friend Eric from Our Life By Eric & Flynn. He has gone to the bridge unexpectedly after a brief illness. His family and friends are devastated and our hearts go out to them. Please be sure to pay them a visit and leave them some comforting thoughts and purrs. That sounds very exciting! I have never heard of these cats. I am so far behind things. I have no time. I have no life. Good luck on being featured on a card. We are still in shock and are very sad to hear about our furriend, Eric. How exciting to get the chance to be on a card! We wish you the bestest of luck and be sure to remind us to vote. (linking it up would really help out our ditzy Mommy, too) Happy Tuxie Tuesday, sweet Katie! We are stunned at Eric's passing. Too much sadness for us this last week, Mommy's still looking for some Ben & Jerry's ice cream to cry into. I'm a contender too - in fact, I'm in the video! Although, I have NO idea what Binga is doing there. At least Waffles did not sneak himself in. Very exciting. Sorry to read about Eric. Wow, that's cool. Congrats, Katie. Congrats!!! She told Cody he may be in the next go round.....we will vote for you for sure!! Why could we picture you as top kitty kat! I'm glad the oversight will be corrected- of course Katie should be on a card. Katie and Waffles too (also). Good luck - we could see that! So sorry about your friend. 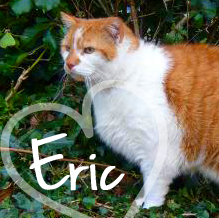 We're reeling over the loss of Eric and so many other cats recently. We're devastated to hear about our friend Eric running off to the Bridge. We will miss him (actually, we already do). You always get my vote sweetie. Just let us know when. he he - if these are normal playing cards and you win, M wants a deck of them so she can see your booitiful face every day. Oh Katie we think you ARE top cat! And we are devastated by the news of Eric's Bridge crossing. It just took us completely by surprise, not knowing how sick he truly was. We've known Eric and Flynn since way way way back. It's hard to lose any friend, but such a long time friend is exceptionally hard. You would be a super cool card cat sweet Katie! We are crushed and so sad about the loss of dear Eric. Katie, you're a shoe-in! I would be offended by that "beg like a dog" thing, only Dave and I aren't dogs. We're Siberian Huskies. There is a marked difference. If any kitty should be on a card, Katie, it's you! Best Fishes! Hi Katie, we'll vote for you. Glogirly and you can count on us. Ah should we vote for Waffles Too too? Of COURSE you will be TopCat! & say, was that Sparkle in the video??? Mes is SURE yous should bes the a Top Cat! Yous is in our books all ready! Thank you for your kind words for Eric. We miss him so much. I´m pretty sure you are going to be the next Topcat Katie !